We all want our homes to feel warm and inviting, but often a room needs to appear larger. A good way to achieve this effect is to mount window treatments several inches above the window. For example, in a room with an 8' ceiling, if you mount a window treatment under a crown moulding or just below the ceiling, not only will the room appear larger but the ceiling height will appear taller as well. Another tip to maximize the illusion of greater ceiling height is to avoid adding a cornice with a straight bottom mounted at the top of a window. Below I have created a rendering with our "Minutes Matter Studio" graphic design software to illustrate the different look achieved when a cornice is mounted at the top of the window, as contrasted to a cornice that is mounted nearer to the crown moulding or ceiling. Notice in the design on the right how much taller the ceiling height appears and how much larger the room appears! Here is another design tip when trying to make a ceiling look higher. Try adding a shape to the bottom of the cornice. By introducing an element of movement at the bottom of the cornice, the eye is tricked into moving up and down, prompting the eye not to stop at the longest point of the cornice. 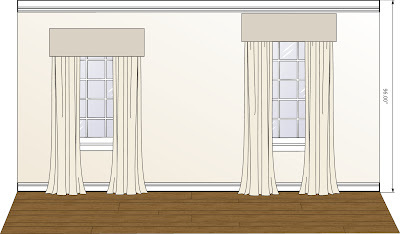 You can also achieve the illusion of added ceiling height by using drapery panels and a decorative rod. 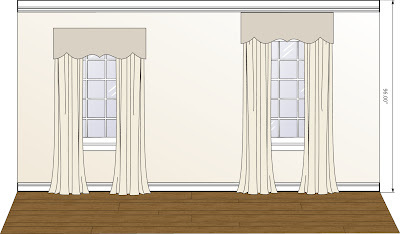 Notice the difference when the drapery is mounted under the crown moulding or near the ceiling, as compared to mounting at the top of the window. We recommend giving all rooms that extra lift. Would you like to see how new window treatments could change your room? 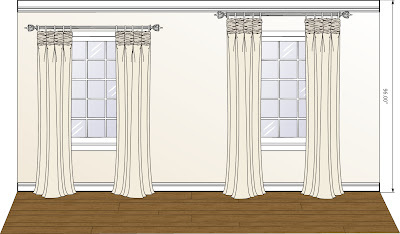 As part of my service, I create computerized renderings to help my clients visualize how new window treatments will look on their windows. Pleas feel free to call!